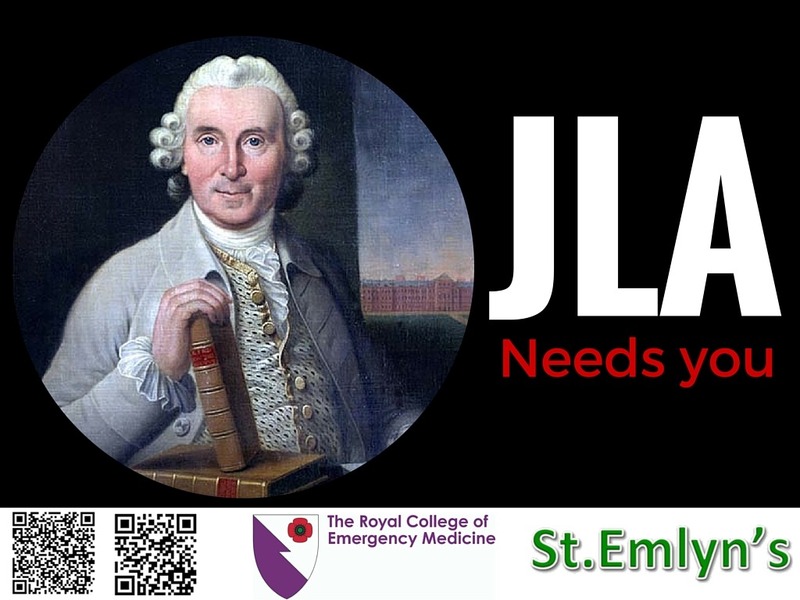 Hopefully you saw our post on the James Lind Alliance earlier this year. 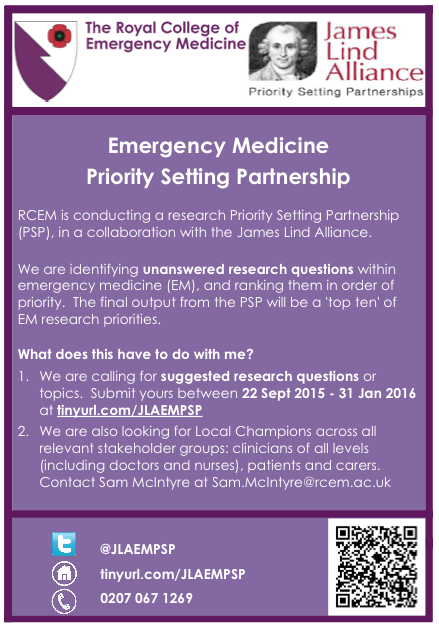 In brief the JLA is working together with researchers, the public and the Royal College of Emergency Medicine to set research priorities for our speciality. The eventual output will be a series of research topics that are likely to be looked on favourably by research organisations (and the people who fund them). Have a listen to the short podcast on JLA recorded this week. Submit your suggested research question or topic now! We want to hear from everyone and gather as many ideas as possible. Submit your suggestion 30 Sept 2015 – 31 Jan 2016. This is the most important responsibility for you and everyone else involved in emergency care. Without great questions we will not have much to work on so itis absolutely vital that we hear from everyone. Social media is one route to this engagement but please get out there and speak to your colleagues, your patients and any local interest groups that might have a great research question for emergency medicine. We need volunteers to act as Local Champions across all relevant stakeholder groups: clinicians of all levels (including doctors and nurses), patients and carers. If you’re interested in becoming a Local Champion for this project, please contact Jason Smith. Local Champion applicants – it would be helpful if you could explain in a short statement why you think you would be suitable. We particularly want to hear from people with the following skills and/or experiences. What if I don’t work in an emergency department, or don’t live in the UK? It does not matter. If you have a great idea or question let us know. If a question is important and relevant we will use it in the priority setting exercise. Hijack your journal club, consultant meeting, trainee meeting, team meeting, Christmas dinner – ANYTHING – to talk about research priorities and get some questions submitted.